To exchange philosophical notes with one’s doctor while conducting a medical physical examination may sound slightly strange and even bizarre here in the West. I wonder though if it would be considered strange in India. As a matter of fact I do conduct those exchanges with my doctor who is an endocrinologist educated in the West but has an Indian name and cultural background. His name is Mudit Jain and he is very competent by the criteria of Western science. At the same time he is familiar with the philosophical writings of the spiritual Vedantic tradition. That is rare indeed. There is another doctor in America whose name is Deepak Chopra who actually gave up medicine to dedicate himself to the writing of books on spirituality and philosophy. In any case, we regularly exchange notes on Western and Eastern philosophical traditions focusing on their commonalities but also on their differences vis a vis science and the positivistic mind-set. I have introduced him to the likes of Vico and his New Science, de Chardin and The Phenomenon of Man and he has introduced me to Sri Aurobindo, whom he reveres. He has in fact a framed picture of Aurobindo in his office. He has suggested that I read Aurobindo’s The Life Divine which I have acquired and am currently reading together with the companion volume The Integral Yoga. Previously, I was not wholly unfamiliar with Sri Aurobindo. I remember reading about him in an issue of Cross Currents (Winter 1972) some forty years ago, an issue which was wholly dedicated to him. Subsequently the curator of that issue, Professor of philosophy Robert McDermott wrote a book on the writing of Sri Aurobindo. That past knowledge remained at the level of the intelligible and rational. However, this time around as I opened the volume on The Life Divine read the table of contents: Book One containing XXVIII chapters with enticing titles such as “The Human Aspiration,” or Delight of Existence: the Solution,” “The Supermind as Creator,” just to mention a few; Book Two: The Knowledge and the Ignorance—The Spiritual Evolution: Part I: The Infinite Consciousness and the Ignorance containing XIV chapters; Part II: The Knowledge and the Spiritual Evolution containing chapters XV to XXVIII ending with “The Divine Life,” and as I opened The Integral Yoga and read its first passage under the head The One Thing Needful: “It is the lesson of life that always in this world everything fails a man—only the Divine does not fail him, if he turns entirely to the Divine. It is not because there is something bad in you that blows fall on you—blows fall on all human beings because they are full of desire to things that cannot last and they lose them or, even if they get, it brings disappointment and cannot satisfy them. To turn to the Divine is the only truth in life,” I was grabbed and held as few books have done for me, books such as Dante’s Divine Comedy or de Chardin’s The Phenomenon of Man and The Divine Melieu. For a more thorough look at de Chardin’s evolutionary spiritual cosmology, see the article I wrote for Ovi on the subject at http://www.ovimagazine.com/art/1812). In fact, what I found most uncanny in perusing the two books by Aerobindo, which I am still in the process of reading, was the affinity of Aerobindo’s view of spiritual human progress and cosmic evolution to that of de Chardin. I’d like to share with the Ovi readers the reflections they stimulated. Aerobindo’s evolution of consciousness culminating in the emergence of future supramental species and transformation of the world integrating evolutionary thinking Eastern philosophy finds intriguing parallels with de Chardin’s integration of evolution with Christian spirituality. Both understood evolution panentheistically as the emergence of the Divine out of matter. The two never met, and neither knew of the other's work. In terms of W.C. Snow's Two Cultures, Teilhard arrives at spirituality from the perspective of the sciences, Aurobindo from the humanities. Aurobindo, in Snow’s view is one of the very few who were able to integrate the “two cultures.” I have treated this topic of the two cultures in an article in Ovi (see http://www.ovimagazine.com/art/9596) I have also explored de Chardin’s Omega point in another article (see http://www.ovimagazine.com/art/8946) where I point out that in de Chadin’s panentheistic evolutionary theology, the personal and transcendent state of maximum complexification towards which the Earth is evolving, is associated or identified with Christ; the end of history, or of history as we know it. This is quite similar to Sri Aurobindo’s independently arrived at but more radical concept of Supramental transformation. The mathematical physicist and cosmologist Frank J. Tipler developed a materialistic "hard science" version of Teilhard's Omega Point. The evolution of consciousness and matter is shown as a diagonal line proceeding from lower left to upper right in the illustration below. 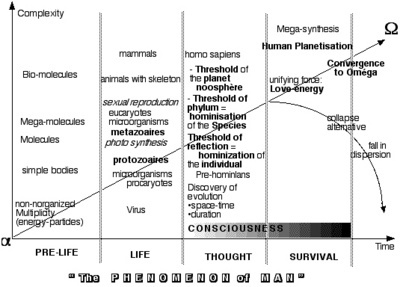 Image: Scheme of The Phenomenon of Man, graphic by J.S. Abbatucci, from de Chardin’s The Phenomenon of Man. Finally a word needs to be said about Transhumanism, an emergent philosophy analyzing or favouring the use of science and technology, especially neurotechnology, biotechnology, and nanotechnology, to overcome human limitations and improve the human condition. Dr. Robin Hanson describes it as "the idea that new technologies are likely to change the world so much in the next century or two that our descendants will in many ways no longer be human. This concept of post human is of course quite controversial in philosophical circles leading to the crucial question : how can we be sure that the change will be for a better humanity? Influences, precursors, and early developments can be found in the philosophy of Nietzsche (the Superman who surpasses the current human species), the Russian Cosmism of Nikolai Fyodorov, the cosmology of Teilhard de Chardin, geneticist J.B.S. Haldane's 1923 essay Daedalus: Science and the Future, which predicted that great benefits would come from applications of advanced sciences to human biology, speculations on space colonization, bionic implants, and cognitive enhancement by J. D. Bernal, futurologist who taught "new concepts of the Human" at The New School of New York City in the 1960s, computer scientist Marvin Minsky, who wrote on relationships between human and artificial intelligence beginning in the 1960s, the Alcor Life Extension Foundation of California, which froze recently deceased subscribers in the 1980s in the hope they would be revived by a future ultra-tech civilization, and the work of Eric Drexler, who in 1986 published Engines of Creation: The Coming Era of Nanotechnology, which discussed the prospects for nanotechnology and molecular assemblers, and founded the Foresight Institute. In the late 1980s Max More and Tom Morrow (such eccentric names are not unusual here!) created his own particular transhumanist doctrine, called Extropianism and laid the foundation of modern transhumanism. Since then, many other forms of Transhumanism have emerged, including Posthumanism, Postgenderism, Singularitarianism, Technogaianism, Buddhist, Hindu and Christian Transhumanism, and more. The value of Transhumanism, Singularitanism, and other such speculations is that they point to a possible future direction that post-biological and post-human evolution might take, a new kingdom of life or threshold of increasable complexity. Such speculations are a popular element in contemporary science fiction, especially "hard science" writers such as Greg Egan, Alastair Reynolds, and Charles Stross. All these themes tie in with early twentieth century visionary metaphysical ideas such as the Omega Point of Teilhard de Chardin and the Supramental transformation of Sri Aurobindo. If 13.7 billion years of cosmic evolution have brought us this far, this is indeed a possible and very optimistic glimpse of the future. Of course, the process is not deterministic or human freedom would be moot and the human experiment might just as likely end with a whimper or a bang in an anthropogenic sixth extinction. At least within time and space it appears that freedom remains a sine qua non. Ultimately it comes down to what the individual decides to believe: wether in a cosmos that is chaotic and bereft of meaning (a nihilistic world) or one with intimations of immortality and bliss (the life divine). In turn what we truly believe will inform how we act in the world. Even modern science is based on faith: the faith or trust in rationality. The etymology of the word for faith in Hebrew is “trust in the future.” Let those who have ears, let them hear. I enjoyed this piece, although I, like Orthodox thinkers and some well-qualified Muslims; for example, Seyid Hossein Nasr, who may still be a professor in Washington, DC, have our problems with various aspects of the direction of Teilhard de Chardin's thought. By the way, I think it's C.P.Snow, not W.C. Fyodorov was a very interesting thinker and remarkable personality, a librarian in Moscow well over 100 years ago who wanted, quite literally, to resurrect the dead! A figure in the Russian apocalyptic tradition, certainly, but with some futuristic overtones. You are doubtless aware that some of the leading Muslim philosophers were also medical doctors. I hope you and your family are all doing well. The two never met, and neither knew of the other's work. In terms of C.P. Snow's Two Cultures, Teilhard arrives at spirituality from the perspective of the sciences, Aurobindo from the humanities. Thought of Pierre Teilhard de Chardin. Like many other Jesuits of his generation, who staffed colleges throughout the world, Teilhard had acquired a background in science, especially in biology and paleontology. Like Ricci, a Jesuit missionary of an earlier generation who mastered astronomy in order to relate to Chinese Mandarin's in his missionary activity, Teilhard mastered biology and paleontology. Thanks for your insightful comments James and Gerard. As you know, Gerard, I first heard of de Chardin in one of your philosophy classes at St. Rrancis College and it was you who introduced me to Cross Currents and the late Joe Cunnen. Best to both you and James. A footnote: The editor of the Journal Cross Currents which issued a whole issue, in Winter 1972, dedicated to Sri Aurobindo was Joseph Cunnen. The book with which Robert Mc Dermott followed that special issue by Cross Currents was titled The Essential Aurobindo, 1987 by Lindsferne Books, MA. The first paragraph of your article reminds me of a statement by C.G. Jung to the effect that throughout much of human history the healer, i.e. the medical doctor and the priest were one and the same person. Cf. Jung's "Psychoterapists or the Clergy - A Dilemma" in the collection of his talks entitled, Modern Man in Search of a Soul. The title is a translation of the more telling German title, "The relationship of psychotherapy to the Care of Souls" (Die Beziehungen der Psychotherapie zur Seelsorge." Well, people still make novenas, and the charismatics have their healing services. I think it would be a mistake to dismiss in this regard religious healing movements such as Mary Baker Eddy's Christian Science. Interesting comments - Gerald, I think it would be more correct to say Sri Aurobindo's philosophy is entirely derived (or at least, has its basis) from spontaneous spiritual experiences, rather than the "humanities," which is to suggest he "figured it out" rather than "saw" it - as he wrote himself. About James' point - as far as I can see, Nasr profoundly misunderstands both de Chardin and Aurobindo - assuming there is necessarily any connection with neo-Darwinian, naturalistic theories and their vision.